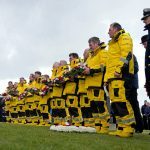 On Sunday, 17 March, 2019, the community of Brims, Longhope came together to mark the 50th anniversary of the loss of the lifeboat TGB on a fateful night in March 1969, when eight lifeboat men made the ultimate sacrifice. 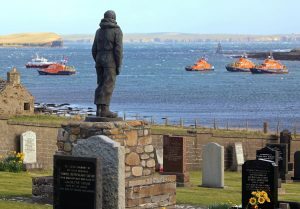 The sun shone over Orkney, and a strong wind whipped up white horses on the Pentland Firth as the lifeboat crew were remembered, with emotions running high during a series of commemorations. Longhope coxswain Kevin Kirkpatrick laying a wreath during the ceremony at Kirk Hope. 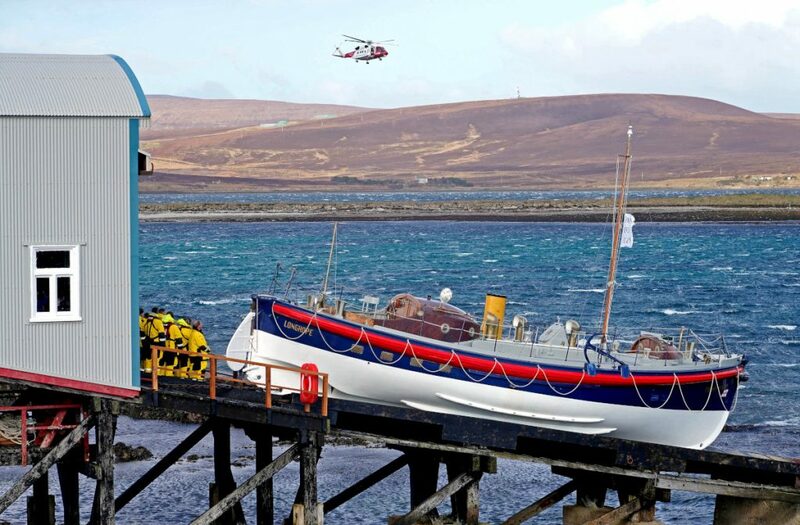 The day started at 11.30am, when RNLI lifeboats from Longhope, Thurso, Stromness and Wick gathered in Aith Hope by the old lifeboat house – now home to the restored lifeboat Thomas McCunn, the centrepiece of the Longhope Lifeboat Museum – from where TGB had been launched 50 years earlier on its last rescue mission. RNLI flags on the lifeboats, and at lifeboat stations around the country, were lowered to half-mast as a mark of respect. To close the first part of the commemoration in the Lifeboat Museum, the local choir sang A Thousand Miles Apart, a song that links the crews and families in Longhope and Penlee, Cornwall, who faced their own tragedy on 19 December, 1981, when their lifeboat Solomon Browne was lost with all hands. Kathleen Houghton also read a poem dedicated to the lost crew. The Longhope lifeboat crew, onboard the relief 16m Tamar Edward and Barbara Prigmore, lay a wreath in memory of the eight lifeboat men lost 50 years earlier. 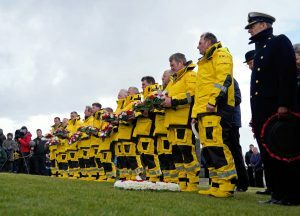 Hundreds of people had squeezed into the old boathouse to hear the speeches, readings and songs, and watch as a flare was fired from the current Longhope lifeboat, whose crew also laid a wreath in memory of the eight men. Following the wreath-laying at the end of the ceremony, a two-minute silence was observed by those assembled in the museum and aboard the lifeboats, with the silence being ended by the firing of a second maroon. 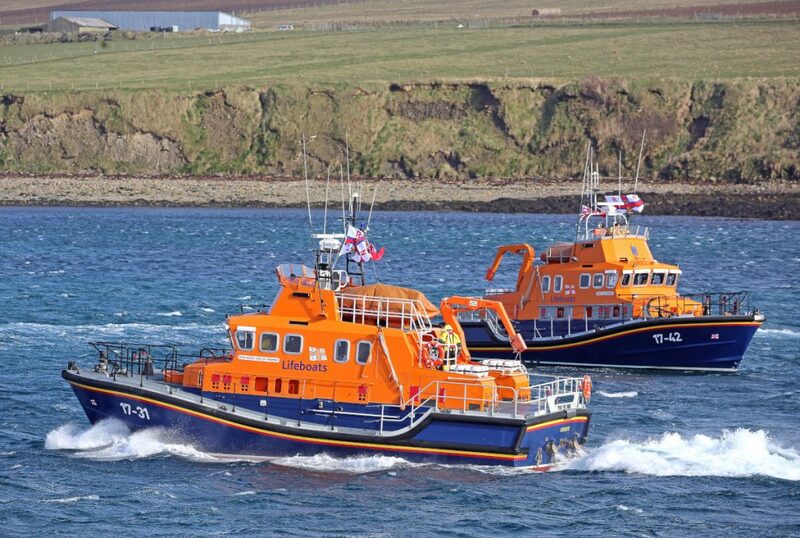 The lifeboats then departed Aith Hope and headed to the memorial to the lost crew at Kirk Hope cemetery. 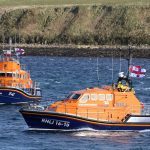 The Coastguard emergency towing vessel Ievoli Black, Orkney harbour tug Harald and pilot boat John Rae were also in attendance at Aith Hope, and the tugs sprayed their water cannons, making a spectacular sight as the lifeboats headed down the Hope and round Cantick Head. The lifeboats then formed a line opposite the Kirk Hope cemetery, where the memorial to the eight lost men stands. They dipped their house flags, held another minute’s silence, and raised their house flags to half-mast before heading down Longhope to the pier. 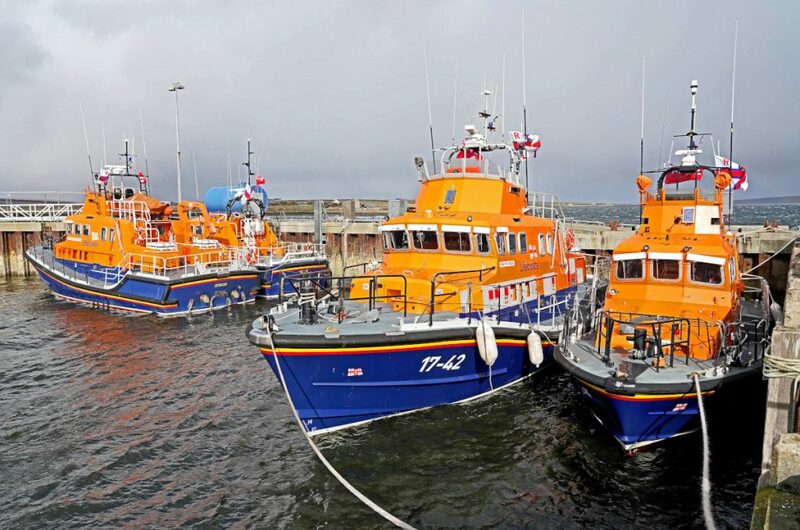 The lifeboats berthed at the pier, and the crews disembarked ready for the final ceremony of the day. An hour later, lifeboat crews from Longhope, Stromness, Wick, Thurso and Kirkwall formed a guard of honour, in their yellows, as the community gathered in the kirkyard cemetery above Kirk Hope. The clouds gathered, reflecting the sombre mood of those present. Prayers were said, and wreaths were laid at the memorial to those lost 50 years ago that day, and thoughts turned to the events on 17 March, 1969, and the dramatic impact they had. Wreaths were laid on behalf of various organisations by Lord Lieutenant Bill Spence, Orkney Islands Council convenor, Captain Chris Smith from the Royal Navy, George Watkins, representing Longhope in Gloucestershire, Police Scotland, Ian Munro from Thurso RNLI, Colin Mowatt from Stromness RNLI, Ian Cormack from Wick RNLI, and Graham Campbell from Kirkwall RNLI. Finally, wreaths were laid in memory of each of the eight lost crew by a member of the current crew: for Dan Kirkpatrick, a wreath was laid by Kevin Kirkpatrick, for Jimmy Johnston by Ian Avis, for Ray Kirkpatrick by Steve Rhodes, for Bob (Sodger Bob) Johnston by Angus Budge, for Jimmy Swanson by Colin Bates, for Robbie Johnston by Stella Kirkpatrick, for Jack Kirkpatrick by Jack Kirkpatrick, and for Erikie McFadyen by Alec Sinclair. 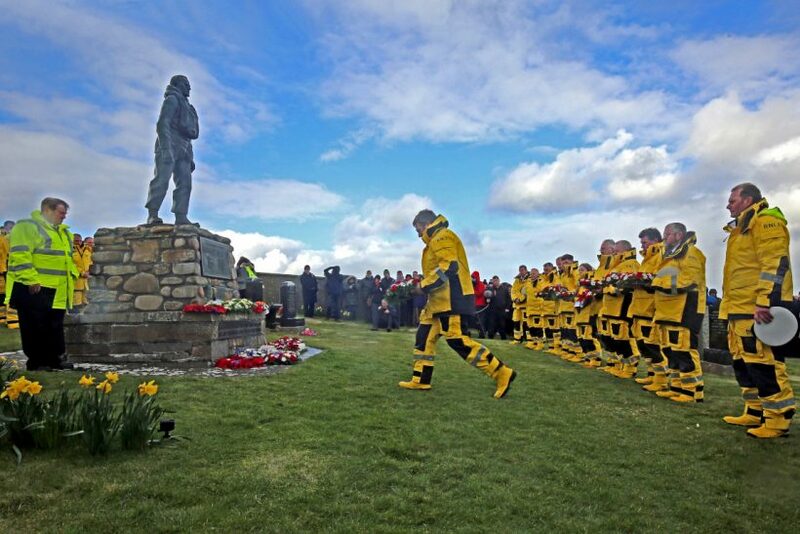 Longhope, Stromness, Thurso and Wick lifeboat crews form a guard of honour at the Kirk Hope ceremony. To finish the day’s events, everyone gathered in the Longhope YM (village hall) for further speeches and a performance of three songs, Heroes of Longhope, Orkney and Rose of St Magnus. Brian Miles read a letter from Dr Sydney Peace, who was the local GP on Hoy at the time of the disaster, having served as the lifeboat station’s honorary secretary until 1962. Dr Peace, now living in Australia, regretted that age and distance prevented him from being at the commemorations, but sent his best wishes and recalled his memories of the tragedy and his happy times on Hoy. Craig Taylor, from HM Coastguard, spoke with emotion about his grandfather, who had been the last person to have contact with TGB’s crew on 17 March, 1969. Craig said the tragedy had greatly affected his grandfather, and on the few occasions when he spoke about it, he said it had been the longest night of his life. And finally, John Budge, the station’s former mechanic and now lifeboat operations manager, ended the speeches with a short recollection of the events immediately following the tragedy, when the community was reeling from the loss of the eight men. He spoke of how the widows had shown enormous strength and courage to carry on, ensure the lifeboat service was continued, and keep the tight-knit community together. 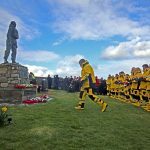 The emotion in his voice was evident as he remembered the strength and fortitude shown in the aftermath of the tragedy, making a fitting end to a day when the heroes of the Longhope lifeboat were honoured. On 17 March, 1969, the 47ft Watson motor lifeboat TGB was launched to the aid of the Liberian ship Irene, after the Auxiliary Coastguard at Brough Ness had contacted station honorary secretary Jackie Groat to say that Irene was in difficulty. The vessel’s position had not been established, but it was believed to be five miles east of Halcro Head, South Ronaldsay. At 7.40pm the maroons were fired, and 20 minutes later TGB was at sea. The southeasterly gale in the Pentland Firth, estimated at the time at force nine, was accompanied by a very rough sea and heavy swell. Visibility was reduced by rain and snow flurries. At 8.40pm, TGB gave its position as three miles southeast of Cantick Head lighthouse. At 9.07pm, it was a mile east of Swona Island. A few minutes later, the lookout at Brough Ness Coastguard station stated that the lifeboat was clear of the Lother Rock. 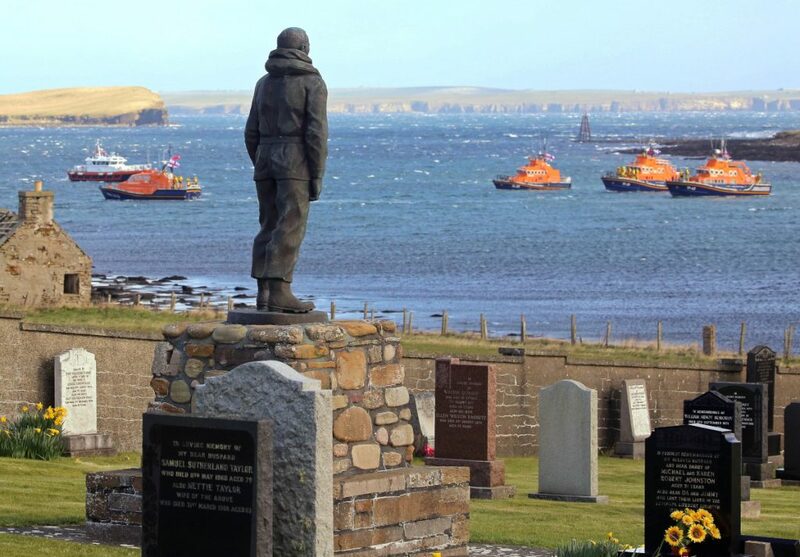 Lifeboat crews pay their respects at the lifeboat memorial at Kirk Hope. 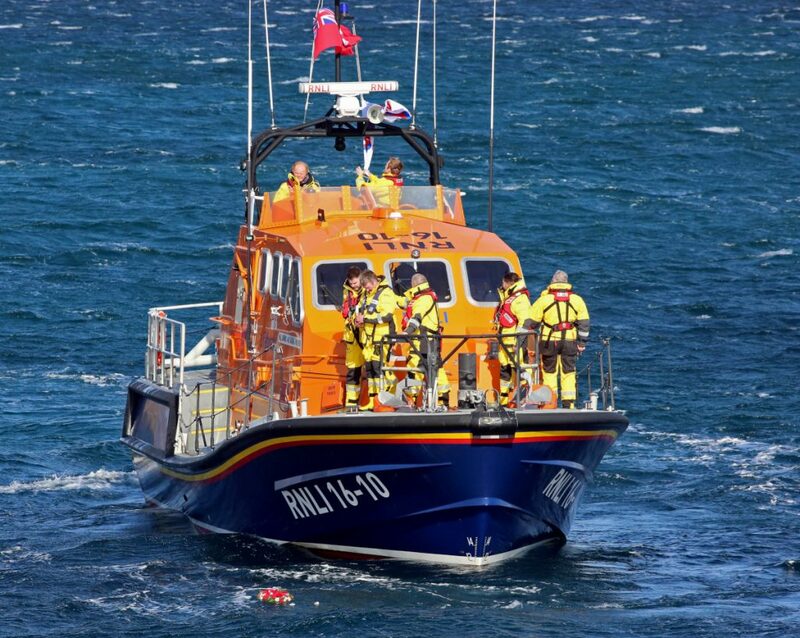 At 9.28pm, the last officially recorded signal from the Longhope lifeboat was received by Wick radio. This message acknowledged a signal giving the latest position of Irene. 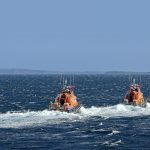 Two minutes later, the principal keeper saw the lifeboat north of the Cantick Head lighthouse, its stern light to the eastward, about a mile away, and it was estimated to be halfway between Brough Ness and Pentland Skerries. 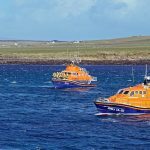 Shortly after 10pm, the Coastguard at Kirkwall asked Wick radio to inform TGB that conditions alongside Irene were ‘almost impossible’, but when this message was not acknowledged, the Coastguard became concerned for the safety of the lifeboat. Coast rescue emergency parties were dispatched to vantage points on the east coast of South Ronaldsay. 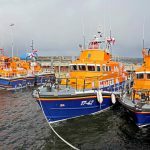 The search was co-ordinated by the Coastguard, while close contact was maintained with the inspector of lifeboats for Scotland, Brian Miles, and the station’s honorary secretary, Jackie Groat. 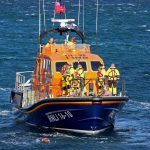 Meanwhile, the 70ft Clyde lifeboat Grace Paterson Ritchie, which was lying at Kirkwall, had put out at the request of the Coastguard. 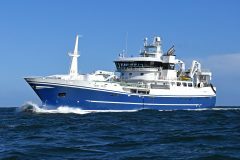 At 9.15pm, Irene grounded half a mile south of Grimness, where a Coastguard team managed to reach it, taking the first man from the ship and bringing him ashore at 12.42am, in the early hours of 18 March. By 1.30am, all the ship’s company were safely ashore. Just after 11pm on 17 March, the Kirkwall Coastguard asked Grace Paterson Ritchie to make for a position south of Irene and rendezvous with TGB. Grace Paterson Ritchie reached the position at 11.15pm and fired a parachute flare, but no reply was received. Staff coxswain Ian Ives, in command of Grace Paterson Ritchie, made for a position a mile southeast of Old Head. In the high seas, visibility was very poor, and finding the Longhope lifeboat in such conditions was impossible. 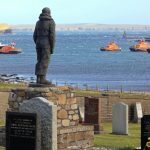 At daybreak, a Shackleton aircraft from RAF Kinloss and a helicopter from RNAS Lossiemouth worked with Grace Paterson Ritchie and the Stronsay, Thurso and Stromness lifeboats, all of which put out on the morning of 18 March. 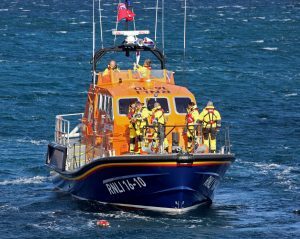 Not until 1.40pm on 18 March did the Thurso lifeboat crew spot the Longhope lifeboat, upturned, four miles southwest of Tor Ness. 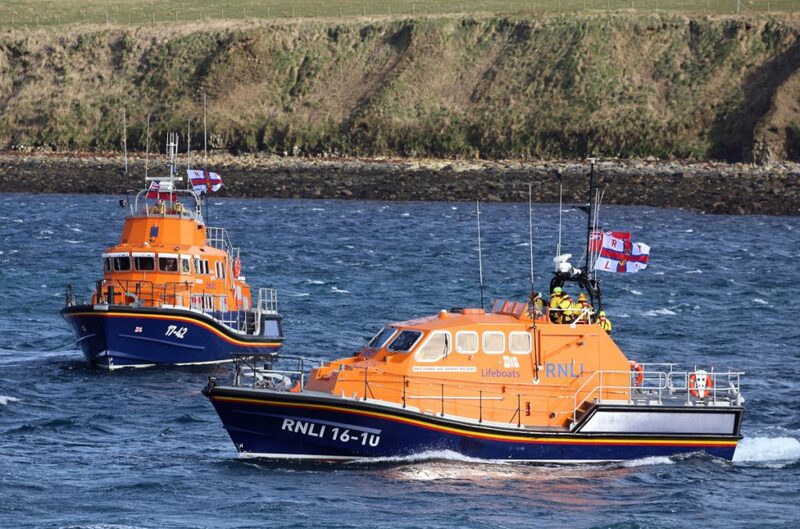 The stricken lifeboat was towed to Scrabster harbour, escorted by the Stromness lifeboat. Only seven bodies were recovered, six with lifejackets on. Coxswain Daniel Kirkpatrick was not wearing a lifejacket. The door of the port side of the wheelhouse was found open, and it is probable that the missing man, James Swanson, was either lost overboard before the capsize, or that his body was lost through the open door. 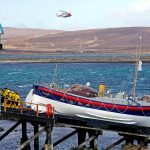 The immediate aftermath of the tragedy saw representatives of the RNLI fly to Hoy and attend to the needs of the lost lifeboatmen’s families. Margaret Kirkpatrick and Maggie Johnston had both lost a husband and two sons. The lord lieutenant of Orkney launched a special appeal for the families of the lost men. Meanwhile, the funeral service for the lifeboat men was held on 22 March at Walls Old Parish Church, Hoy. Following this terrible tragedy, the RNLI carried out a detailed inquiry into the events that led to the lifeboat’s capsize. A procurator fiscal’s inquiry found that the seven crew, whose bodies had been found in the upturned hull of the lifeboat, died from drowning. The body of the eighth man, James Swanson, had not been recovered. No evidence indicated negligence; there was no evidence that the boat or equipment was anything other than first-class; and all precautions and procedures which ought to have been taken, had been. The actions of the honorary secretary and the Coastguard were deemed correct, as were those of the staff coxswain in charge of Grace Paterson Ritchie. Although nobody was sure exactly what had happened to the lifeboat, the inquiry report stated that it had capsized after being overwhelmed by ‘very high seas and maelstrom conditions’. In the immediate aftermath of the tragedy, there was never any suggestion that the station would close and, within a week, even before the funerals, men had come forward to volunteer and be trained. Stewart Taylor, currently lifeboat operations manager at Stromness, was just 20 and shore crew for TGB in 1969, and had worked with Dan Kirkpatrick on the morning of 17 March. Stewart joined the new crew in the aftermath of the tragedy. 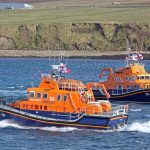 The 52ft Barnett-class lifeboat Hilton Briggs was sent to Longhope as a temporary measure, and Jack Leslie from Stromness was appointed as coxswain. The first call following the disaster came in June 1970. A permanent replacement, the new 48ft 6in Solent-class lifeboat David and Elizabeth King & EB, with Jack Leslie as coxswain, was on station by December 1970. 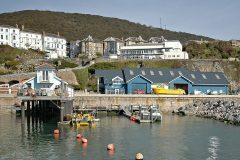 Longhope lifeboat station is now served by the state-of-the-art 16m Tamar-class lifeboat Helen Comrie, which has been on station since 2006, and is berthed at Longhope pier. 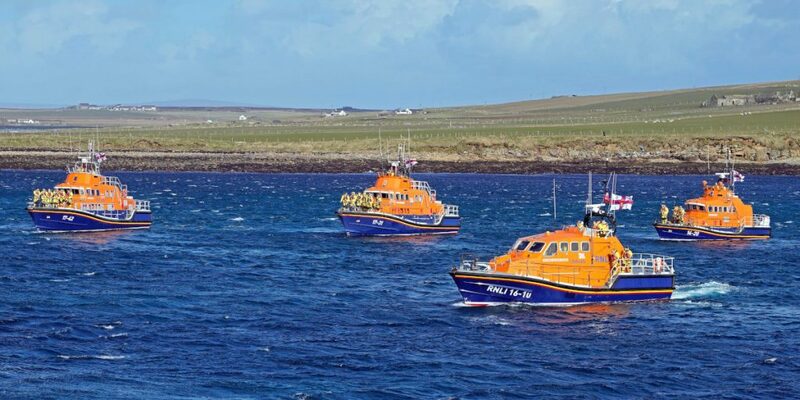 Kevin Kirkpatrick, grandson to Dan, is the station’s coxswain, carrying on a family tradition, and ready to go into the Pentland Firth to save lives at sea. Kevin, and all the volunteer crew, continue the service embodied in the lost crew of TGB, and the events of 17 March, 1969 ensure the eight men will never be forgotten.